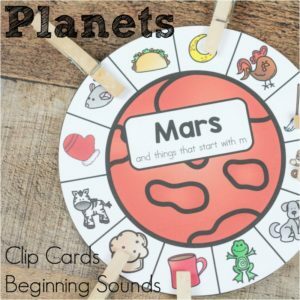 Feel inspired with space and beginning sound clip cards! 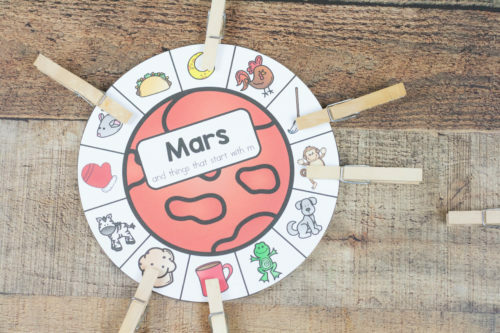 Practice those beginning sounds, work on fine motor skills, all within a space theme.Space seems to be an excellent motivating theme in our house. They love planets, space shuttles, meteors, aliens, and everything in between. So more space themed stuff is on the docket. I don’t suppose they’ll ever get sick of outer space! These are a really simple set up, but I do have a suggestion. They are rather large which is great for little hands. But for slightly older kids, a smaller set would be okay. You can print 2 to a page to save paper. They’ll be slightly smaller (half the size) but it’ll work just fine. Make sure to print on cardstock or laminate (or both). These clip cards need the stability to hold on clothespins. Then just cut them out! No special folding or anything like that required. 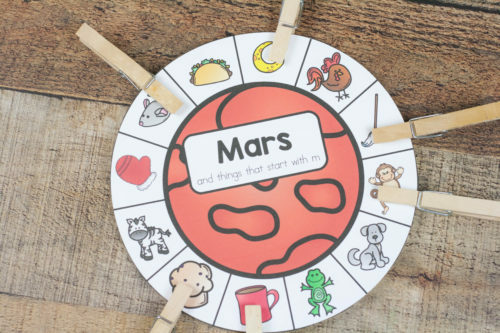 There are 4 clip cards included – one for Mars, Venus, Jupiter, and Neptune. 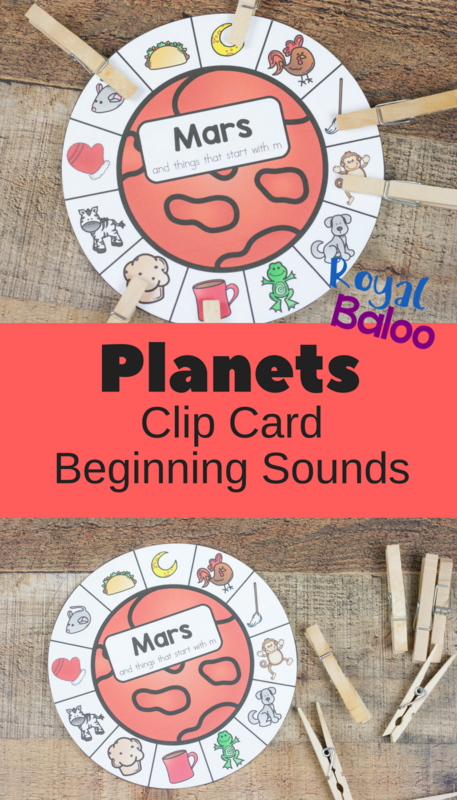 Each card features the beginning sound of the planet. 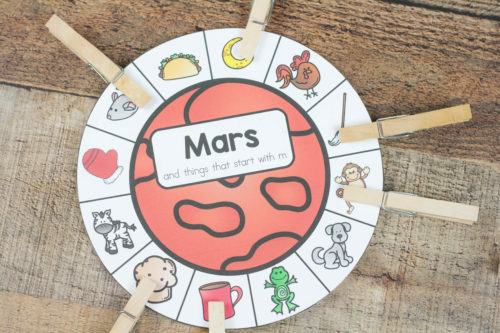 The idea is to clip the objects that start with the same sound as the planet. 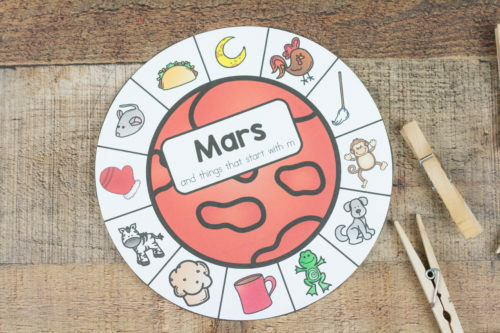 So on Mars, the words that begin with m sound be clipped. Mouse, moon, mop, monkey, etc. You can add little dots on the back for the correct answer. 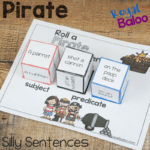 This way your kids can self-correct when using the clip cards. You don’t have to use clothespins. There are many other options such as covering the correct ones with gems, small blocks, unifix cubes, or something similar. For a one time use, you could hole punch the correct answers. 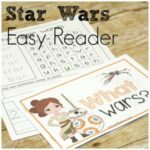 Cover them with little star erasers or some other manipulative.